With cruising speeds of 30 knots and fuel ranges of well over 500 miles, the Sea Wrangler and the Blackout are the fastest charter boats in Port Canaveral by over 8-10 knots, and will get you to the fish fast and comfortably leaving our competition well behind. Fast boats mean much less travel time, more time fishing, and no boundaries to find the fish!!!! 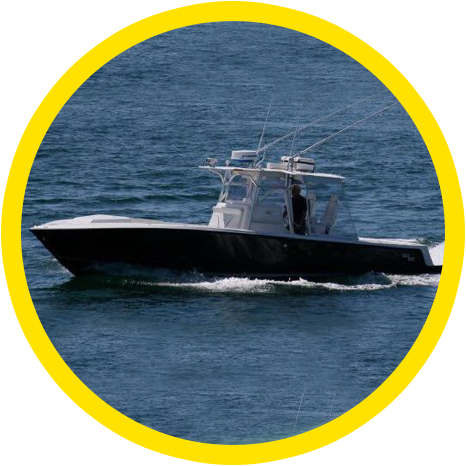 The Sea Wrangler is a custom-built 30ft Sea Vee designed for speed, comfort, safety, and serious fishing. Sea Vee is world renowned for their quality construction, smooth and comfortable ride, and unmatched speed and performance. US Coast Guard Safety Approved!! The Blackout is a custom-built 35ft Sea Vee, the Mac Daddy of Center Consoles. She is designed for speed, extreme comfort, safety, and serious fishing. With a fuel range of well over 500 miles and a cruising speed of 30 knots, this boat sees no boundaries and absolutely leaves the competition behind. 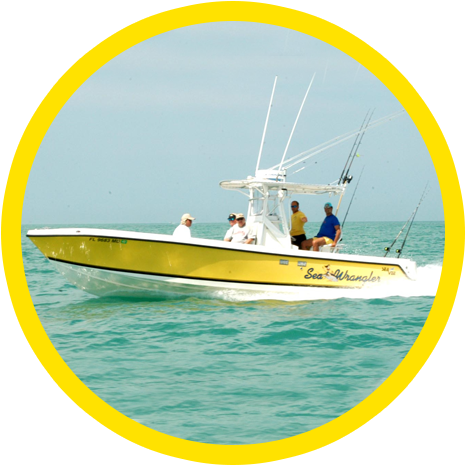 Center Console offshore fishing boats have become the “go to” boat for serious anglers who want to get to the fish fast and comfortably and benefit from the 360 degree open area. More Fresh Air = Less Sea Sickness. Motion sickness is a product of confusion of the equalibrium from motion. Add the motion with Diesel fumes, heat, and lack of fresh air from traditional covered boats and you have a recipe for a very miserable day. Center Consoles ensure you have fresh air the entire day without having to even get a whiff of diesel fumes. Visibility of the Horizon= Less Sea Sickness. Because motion sickness is caused from a disturbed equilibrium, the worst thing you can do is go inside an enclosed space. Center Consoles ensure you will always have visibility of the horizon with very little upsetting your equilibrium. We have seen more people sick on 50ft enclosed boats than we have ever seen on our boats. One of the greatest attributes of a Center Console is its ability to allow anglers to fish 360 degrees around the boat. If your fish runs to the bow, all you have to do is follow the fish without maneuvering the boat. This allows us to hook up multiple fish and spend more time maximizing hookups instead of maneuvering the boat. Traditional enclosed boats must get off of the fishing spot to cater to the ONE fish that runs to the bow because the angler is limited to the small cockpit in the back. Our boats are the fastest charter boats out of Port Canaveral by about 9 knots. This gives you more fishing time and less travel. It also allows us the options of running further and not being limited to one area if the fish start biting elsewhere throughout the day.